Last summer, Country Boy’s chilli plants were prolific. We had chillies everywhere, and while I quite like a little bit of spice in my food, there was no way we could possibly eat them all. To use up the left over chillies I had a go at drying them. It worked beautifully, and was really quite easy. 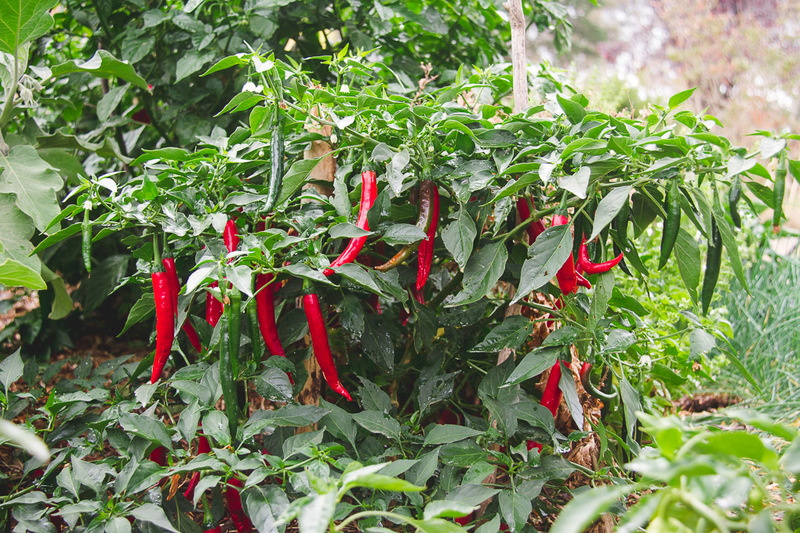 If you don’t grow your own, you can often pick up a bag of fresh chillies cheaply at a farmer market. To dry chillies, pick them and allow them to dry. Get some heavy duty fishing line or something similar, and a large darning needle. Tie a knot in the end of the fishing line (a nice big knot is good), and thread all the chillies on to the line through the base of the stalk (just above where the chilli and stalk meet). Once the chillies are all threaded, leave some extra line, and make a loop to hang the chillies up. It really is just a matter of leaving the chilli string somewhere that has a good air flow, and is nice and dry for a few weeks. 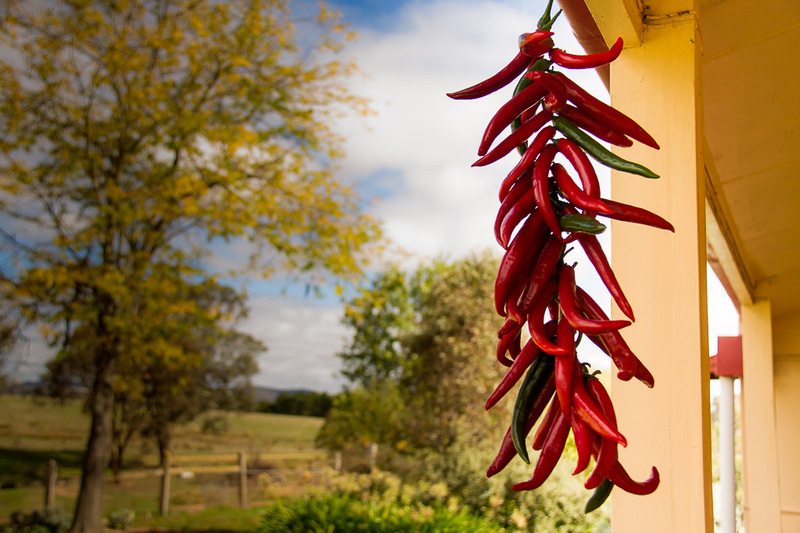 I began by hanging the chilli string under our verandah, but later moved it inside. A few weeks later the chillies were dry, and I popped them into a bag to keep until we needed. You could pop some in a food processor for a while and make either chilli flakes, or chilli powder (depending on how long you leave them in the processor). 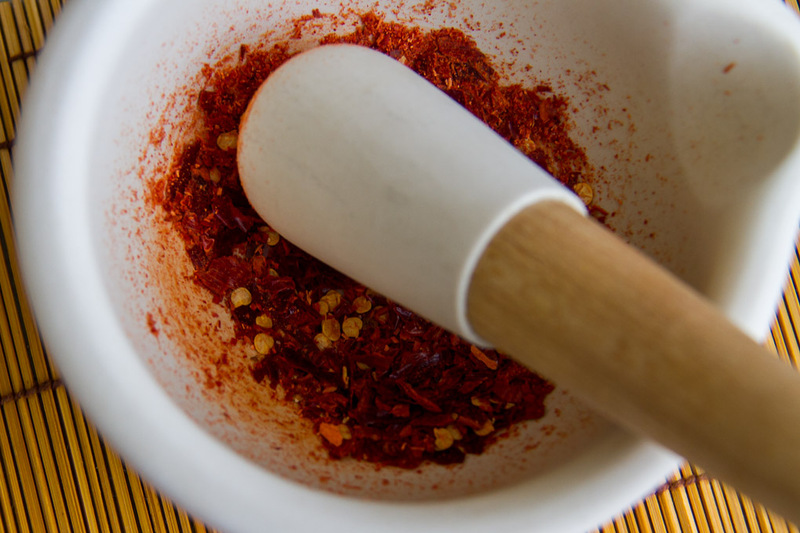 We have kept our whole and either grind them with a mortar and pestle as we need them (add a pinch of salt to make it easy to grind), or else pour a little hot water over them to reconstitute before we use them. Keep in mind that the chillies will get hotter as they dry. Be careful not to touch the chillies and then your face or body without washing your hand first. 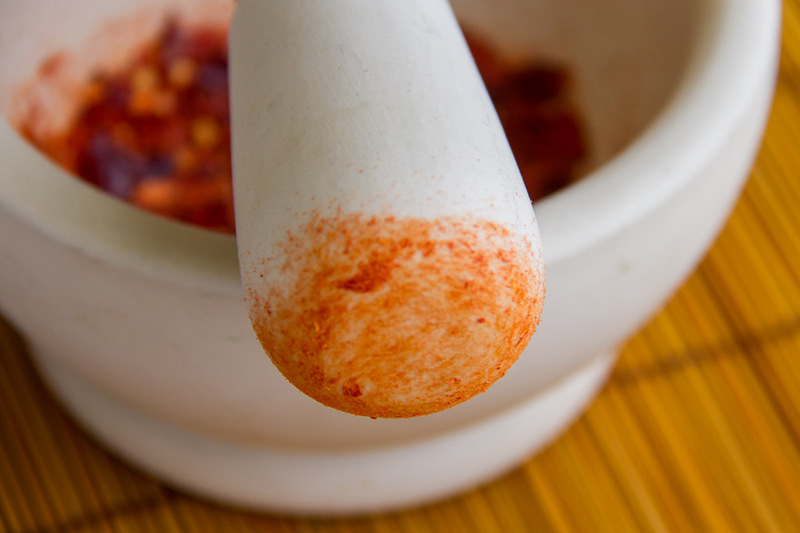 The chemical which makes the chillies hot and spicy, will also burn your skin. 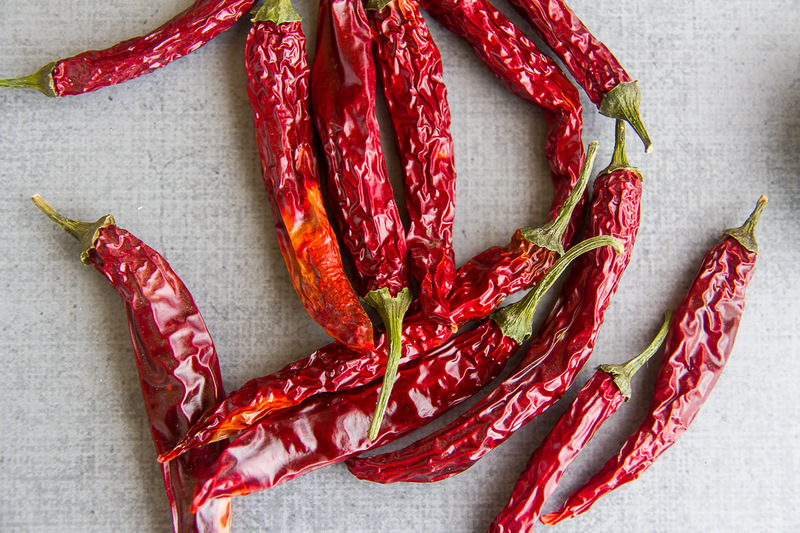 Have you tried drying chillies? Got any other tips? They look very pretty hanging up! I actually put mine in the food processor and then spread them out in sheets either in the food processor or the wood stove oven (sometimes we have chillies in winter…). Then I just keep the flakes in a jar. We have so many, I have been bringing them to work to give away! That sounds like a great way to do it too! I accidentally dried some in the fridge. They were loose in a compartment on the door and when I remembered them and went looking, they were dehydrated. Lots of other little things in that compartment had hidden them. Just before I read your post, minutes before actually, I had been wondering where to hang some. My balcony woukd be great but woukd get fumes from Parramatta Road. I have a great storage cupboard/pantry but am not sure if there is enough air movement in there. It opens onto lounge room, so I really don’t want to have door open all the time. Oh well, perhaps a country move. I wish!